Barring any unforeseen situation, the ruling All Progressives Congress (APC) will, on Wednesday, September 19, elect its flag bearer in next year’s elections. 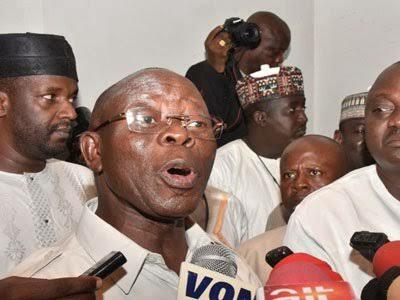 The choice will be through either direct or indirect primary, party chair Adams Oshiomhole said in an August 17,2018 letter to the Independent National Electoral Commission (INEC). Also to be elected on September 19 are the party’s candidates for the House of Representatives election, Oshiomhole said in the letter. The letter shows that the national convention to elect the presidential candidate will be preceded on Saturday, September 8 by nationwide congresses to elect delegates to the convention. On September 20 party members will elect candidates for the senatorial election to be followed on Monday, September 24 by the nomination of governorship candidates and on Saturday, September 29 by the nomination of candidates for House of Assembly election. All dates are subject to ratification by the National Executive Committee of the party. Oshiomhole said: “This serves as a formal notification pursuant to the provisions of section 85 of the Electoral Act 2010 as amended. Kindly arrange for your officials to monitor the exercise accordingly”. The APC accused INEC of leaking its letter on its primaries to the media. To guard against a repeat of such development,the party’s acting National Publicity Secretary, Yekini Nabena asked INEC to look into its internal handling of official correspondence and go all out to stop leakages. Nabena said the National Executive Committee of the party needs to approve the time table for it to become authentic and asked Nigerians and the media to wait for an official announcement from the party as the leaked dates are subject to changes if necessary. Nabena said: “Our attention has been drawn to a leaked letter the National Chairman of the All Progressives Congress (APC), Comrade Adams Oshiomhole wrote to the Chairman, Independent National Electoral Chairman, Prof. Mahmood Yakubu informing the Commission of the schedule of the Congresses and Primaries to elect Party candidates for the 2019 General Elections. “These leaks of our sensitive and confidential correspondence to INEC is becoming commonplace and totally unacceptable. We strongly request that INEC looks into its internal handling of official correspondence and put a stop to these leaks. The Nation gathered that the party plans to hold its NEC meeting on Wednesday, 29th August to approve the party’s programme for the 2019 general elections, including whether to use direct or indirect primaries for the selection of its candidates and the fresh membership registration. Under INEC timetable and schedule of activities for the 2019 elections, party primaries for the Presidential, Governorship, Federal and State Elections are to run between August 18 and October 7, 2018, while that of the FCT Area Council Elections will commence on September 4 to end on October 27, 2018. The 2019 elections will take off on Saturday, February 16 with the Presidential and National Assembly elections. It will be the turn of Governorship and State Assembly/Federal Capital Territory (FCT) Council elections on Saturday, 2nd March 2019.